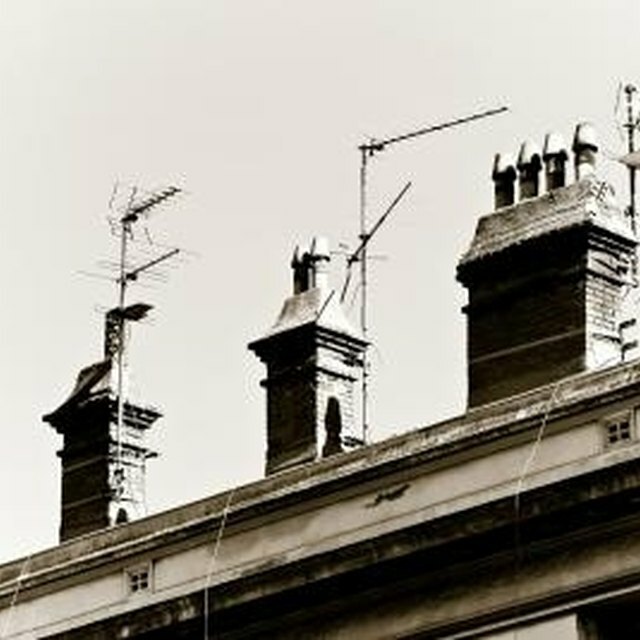 A roof antenna provides free television by receiving transmissions from local broadcast towers set up by the TV networks. An antenna cable must be connected between the roof-mounted antenna and the television in order for the signal to be received. To install the antenna cable correctly and safely, employ a series of household tools accompanied by a few supplies from a hardware store. Remove the screws surrounding the air duct cover on the wall of your home nearest to the television that you want to watch using the roof-mounted antenna -- use a Phillips screwdriver to remove the screws. Remove the air duct cover and place it aside. Screw an end of the antenna coaxial cable into the coax output connection on the antenna on the roof. Run the coaxial cable along the roof until you come to an air duct. Staple the coaxial cable to the roof with U-clamp staples from a stapler gun. Apply a layer of silicone paste over the antenna's coaxial connection to insulate it from the elements. Tape an end of a "fishing line" to the free end of the coaxial cable with strips of duct tape. Tape a lead weight to the other end of the "fishing line" with strips of duct tape. Remove the screws surrounding the cover from the air duct, if there are any, using a Phillips screwdriver. Grip the air duct cover. Pull the air duct cover off and place it aside. Drop the end of the "fishing line" that has the lead weight on it into the air duct. Have a person standing by the air duct in the home pull the lead weight out of the wall. Drill a hole in the inside left corner of the air duct with a portable drill. Remove the lead weight from the end of the coaxial cable. Push the end of the coaxial cable through the hole in the side of the air duct. Drill a hole in the wall next to the side of the air duct where the end of the coaxial cable is now residing inside the wall. Pull the end of the coaxial cable out of the wall and run it down to the baseboard. Run the coaxial cable along the baseboard until you come to the TV. Staple the coaxial cable to the baseboard with U-clamps from the stapler gun. Screw the free end of the coaxial cable into the coax input (labeled "Ant") on the back of the TV. Place the air duct covers back on the air ducts inside and outside the home. Reattach the screws to the inside air duct cover and to the outside air duct cover, if there are any.